Dries Mertens scored a last-minute equaliser as second-placed Napoli held Roma. The game started without the video assistant referee technology because of technical problems, which were fixed by the 12th minute. Roma, who are in eighth place, led when Stephen el Shaarawy converted Cengiz Under's cross. 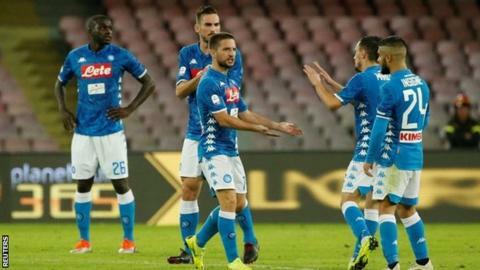 But Mertens equalised when he turned home Jose Callejon's scuffed shot from Lorenzo Insigne's cross. Earlier in the day, Suso scored a winner as AC Milan beat Sampdoria 3-2 in an entertaining game. Match ends, Napoli 1, Roma 1. Second Half ends, Napoli 1, Roma 1. Goal! Napoli 1, Roma 1. Dries Mertens (Napoli) right footed shot from the right side of the six yard box to the top right corner. Assisted by José Callejón. Attempt missed. José Callejón (Napoli) left footed shot from the centre of the box misses to the right. Assisted by Lorenzo Insigne with a cross. Corner, Roma. Conceded by Kevin Malcuit. Corner, Roma. Conceded by Allan. Offside, Napoli. Allan tries a through ball, but José Callejón is caught offside. Offside, Napoli. Allan tries a through ball, but Mário Rui is caught offside. Corner, Napoli. Conceded by Aleksandar Kolarov. Offside, Napoli. Allan tries a through ball, but Dries Mertens is caught offside. Attempt blocked. Fabián Ruiz (Napoli) right footed shot from outside the box is blocked. Lorenzo Pellegrini (Roma) is shown the yellow card. Robin Olsen (Roma) is shown the yellow card. Corner, Napoli. Conceded by Lorenzo Pellegrini. Attempt missed. Lorenzo Insigne (Napoli) right footed shot from outside the box misses to the left. Assisted by Piotr Zielinski following a corner. Corner, Napoli. Conceded by Federico Fazio. Attempt blocked. Fabián Ruiz (Napoli) left footed shot from outside the box is blocked. Assisted by Kevin Malcuit. Corner, Napoli. Conceded by Davide Santon. Substitution, Roma. Federico Fazio replaces Kostas Manolas because of an injury. Substitution, Napoli. Piotr Zielinski replaces Marek Hamsik. Attempt blocked. Lorenzo Insigne (Napoli) left footed shot from outside the box is blocked. Assisted by José Callejón. Corner, Napoli. Conceded by Kostas Manolas. Attempt saved. Lorenzo Pellegrini (Roma) left footed shot from outside the box is saved in the bottom right corner. Assisted by Edin Dzeko. Attempt blocked. Stephan El Shaarawy (Roma) right footed shot from the left side of the box is blocked. Assisted by Lorenzo Pellegrini. Substitution, Napoli. Kevin Malcuit replaces Elseid Hysaj. Attempt blocked. Lorenzo Insigne (Napoli) right footed shot from the centre of the box is blocked. Assisted by Dries Mertens with a cross. Dries Mertens (Napoli) wins a free kick on the left wing. Attempt missed. Lorenzo Insigne (Napoli) left footed shot from the centre of the box is high and wide to the left. Assisted by Marek Hamsik. Substitution, Roma. Alessandro Florenzi replaces Cengiz Ünder. Offside, Napoli. Mário Rui tries a through ball, but José Callejón is caught offside.